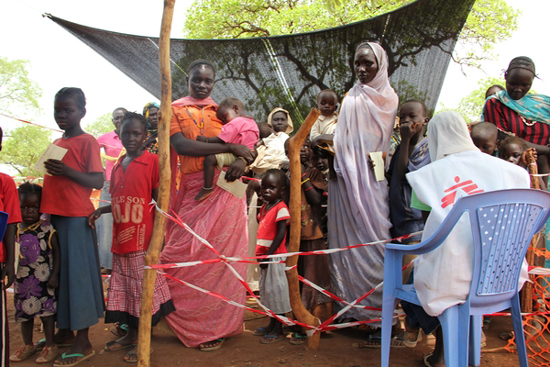 Refugees in South Sudan: "We Walked for Six Days ... With Nothing But Our Clothes"
Refugees fleeing conflict and food insecurity in the Nuba Mountains face insufficient levels of assistance in Yida camp. These first-hand accounts describe the situation for tens of thousands of refugees who fled fighting in Sudan and now face a full-blown humanitarian crisis as they seek refuge in already-overcrowded camps in South Sudan. "My child is suffering from malaria, and has been in the hospital now for four days. She is one month old. We’ve only been one week in Yida. We came from the Nuba Mountains [in South Kordofan, Sudan]. My husband and I fled the war with our ten children. There was no food, no medicine, nowhere to take my sick baby to receive care. We had been hiding in the bush since last June. We spent two days walking to get here, and my baby got sick in Yida. I want to go back eventually, but we’ve been waiting for peace, and it hasn’t come." "My child is here in the hospital, sick with diarrhea [and] dehydration, and he also has ulcers in his mouth. He has been sick for five days. I come from Kadugli in the Nuba Mountains. I fled with my nine children, and had to leave my husband behind. I have had no news from him since we left for Yida in September. We walked for six days, and had to leave quickly, with nothing but our clothes. I came with my entire village—we all had to leave because of the war. I saw people die on the way here, including three children. Since we have been here, my children are often sick with diarrhoea—they are suffering all the time. Sometimes the food rations we receive don’t last for the whole month. We are hungry." "We were on the road for two months. Many villages we went through kept being bombed, so we had to keep fleeing. We had food for two weeks, then we ran out. We ate the lalop fruit and leaves from trees. We gave food for the children mostly, and some days we had nothing to eat. Some people got very sick and we had to leave some by the road—we could not carry them and they were too weak to continue." "When we arrived in El Fuj [border crossing point], we stayed there for one week. We were very tired from walking and not eating. We were given a little bit of food and then came here 12 days ago. We have not been given anything here. We have no plastic sheeting, no food. We are eating leaves from the trees, but it is not enough, people are getting sick. And there is not enough water. There was a food distribution today, but we have not received anything. I have seven children and no food to give them." "People nowadays are suffering from hunger, in Doro and Jamam camps. If you go to the clinic, you see many people and children suffering from malnutrition; dehydration. From the time that they fled from Blue Nile, people have very little food. Even when there are rations—it is not enough food. "I am happy to work here because I can help my community form Blue Nile. I am a refugee like them. It makes me very proud to work with MSF and to help my community. It makes me very proud and happy to do this job because people are suffering so much. They are here without plastic sheeting, without food, without enough water. That’s why when we reach them, they are having problems with diarrhea. Malnutrition actually is now very common. We are trying our best to help them and I thank MSF for being the first organization to be here when we arrived from Blue Nile. They are helping us so much.